Here are some tips for simple things you can do at home to help you decrease, and possibly eliminate, the amount of medication you're taking for post-nasal drip. These suggestions can make you more comfortable and possibly even speed your recovery. These symptoms can be caused by allergies or cold viruses. Post-nasal drip can also occur with hormonal changes such as happen during pregnancy or as a side effect of certain medications. Your post-nasal drip lasts longer than a few weeks. You feel like you're choking. You suspect a bacterial infection. The following home remedies are helpful in treating post-nasal drip, regardless of the exact cause. You can use some treatments in conjunction with your doctor's prescription, however, check with your doctor first to avoid interactions. Avoid dairy products. While dairy doesn't cause your body to make mucus, it may make it thicker. Drink plenty of water because staying hydrated can thin the thickened mucus. Also, avoid dehydrating beverages, such as anything with caffeine or alcohol. Use a humidifier next to your bed at night or take hot, steamy showers. To loosen the thick mucus, breathe warm, moist air. 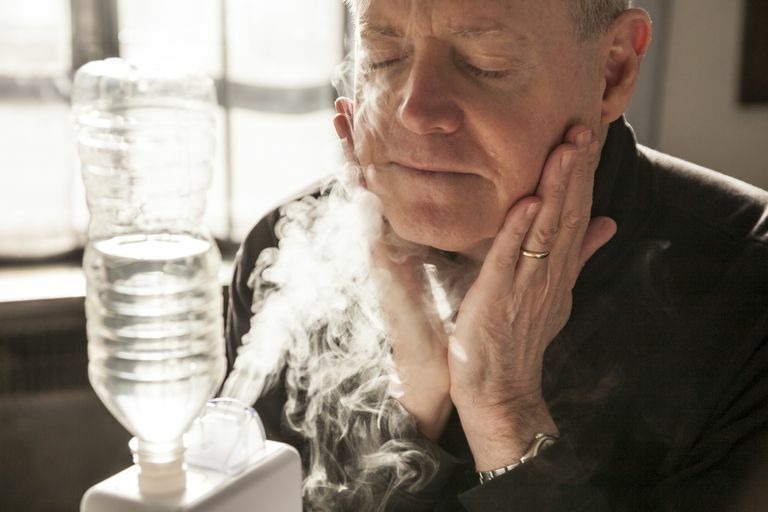 A cool mist humidifier (versus warm mist) is helpful if you have inflammation in your throat or nasal passageways. Try an over-the-counter saline nasal spray to loosen thick mucus and clear the debris from inside your nose. This can be used quite frequently throughout the day. A neti-pot (a small and simple device yogis use for nasal irrigation) is helpful in relieving symptoms. While most studies on neti-pots show positive results, at least one study shows regular use of neti-pots may increase your risk of developing a sinus infection. Therefore, you probably shouldn't use a neti-pot regularly and not at all if you suspect a sinus infection or are particularly prone to developing sinus infections. Eat spicy foods, including the chili peppers in Thai or Indian food and the wasabi in Japanese cuisine, because they are expectorants. The spiciness encourages your body to expel mucus and is also known to lift your mood. Avoid spending a lot of time in cold temperatures. For example, avoid exercising outside in cold weather. This is because cold weather encourages your body to produce more mucus. Despite the popularity of essential oils right now you should avoid using these substances in small children or infants or if you have an underlying lung condition that could be aggravated by inhaling these oils.